has been adopted. 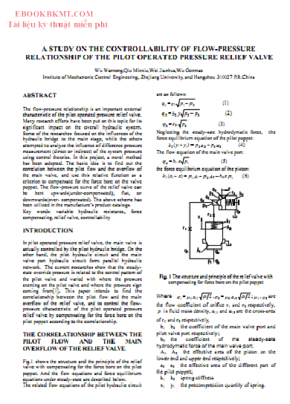 The basic idea is to find out the correlation between the pilot flow and the overflow of the main valve, and use this relative function as a criterion to compensate for the force bore on the valve poppet. The flow-pressure curve of the relief valve can be bent upwards(under-compensated), flat, or downwards(over- compensated). The above scheme has been utilized in the manufacture’s product catalogs.